Dragons are mythical creatures that appear in many different cultures and time periods. Dragons have been described as monsters, serpents, reptiles, or beasts. 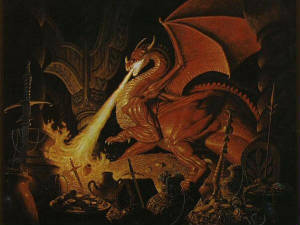 However, there is something magical about dragons that have kept our intrigue over many centuries. Dragons are usually thought to have wings and breathe fire. They also are said to have scales and claws. Some also have horns. Almost always they are said to be venomous. Some dragons may have two or more heads. They may also have more than one tail. They may have two, four or even more legs; however, most are known to have four legs. Dragons are said to eat things such as rats, birds, snakes, bats, or even humans, especially children. Dragons are very intelligent creatures. They live in remote areas, far away from humans, in places that are dark, damp and secluded, such as caves. Dragons were first thought of as creatures who lived in water. Later they became associated with fire. Sea serpents may have been the first dragons, and may be the reason for this association. villain from whom the hero must protect the city or the princess. But some dragons can take on the form of the protector. The biggest differences in dragons usually come from different cultures, especially the cultures of the East and the West. Each culture seems to have their own idea about dragons. Dragons cannot be put all into one group, as there are so many dragons. Each culture seems to have their own type of dragon, and each of these dragons is usually very different. Some people have said that dragons once existed, maybe during the time of the dinosaurs. Others believe that dragons began around the same time the earth began. A few people even claim to have seen a dragon in their life time. Of these people who claim to have seen one, they usually agree that it was humans who finally defeated the dragons. 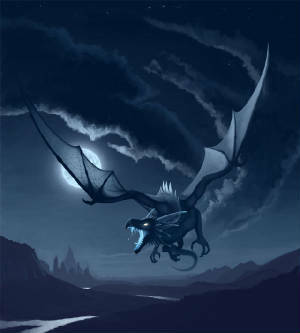 But most of all, dragons are fascinating, magical creatures who have captivated our attention for thousands of years. The many different kinds of dragons and the ability for us to use our imagination to create these creatures only adds to their appeal. Many stories have been told about these great beings and it seems like dragons are a part of our mythical history. Whether these creatures are or ever were real probably doesn't matter due to the fact that the imagination can create them in almost any situation. 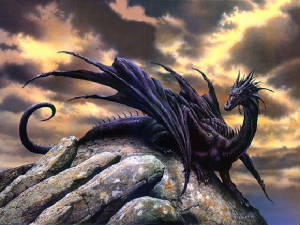 Dragons have often been used in art work. Pictures or sculptures of dragons seem mysterious and magical. Although the time that dragons first appeared in myths isn't known for sure, they can be traced back as far as approximately 4000 B.C. Dragons are said to have been able to live almost anywhere, depending on the type of dragon mentioned. Their habitats range from the center of the earth to the middle of the ocean. They could also be found in caves, fire, or anywhere dark and damp. Stories of dragons appear all throughout history and almost every culture has their own idea about dragons. Some reasons for this could be the finding of dinosaur fossils. Dragons could be used to describe the indescribable bones of unknown creatures. There are stories about dragons in every part of the world, with the exception of Antartica. Even though there are no people in Antartica, which in that way would seem to make it attractive to dragons, the climate proposes a problem for these creatures who like fire or live in water, but not ice water. One type of dragon, or sea monster, was feared back in the time of Christopher Columbus. During this time when the world was thought to be flat, these dragons were said to be at the edge of earth, waiting to eat any one who dared to sail that far into the ocean. This story kept many people from exploring farther into the world. Maps were even made marking the place where these dragons lived. At the edge of the map the words "Here Be Dragons" was almost always printed. 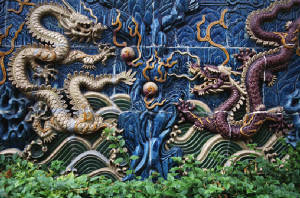 Dragons have also appeared in stories that go back to the time of the gods in mythology. The story of Perseus and the Dragon of Posdeidon tells of a vain queen who almost sacrificed her daughter to the dragon, had it not been for Perseus. Dragons appear most in fairy tales and myths. In most cases the dragon is the keeper of some treasure, either gold and precious jewels or a maiden in despair. A knight in these stories must come to rescue the girl, or to retrieve the riches. To do this he must slay the dragon. Almost all young children have heard stories of dragons. A story that arose from the Middle Ages is about a knight, later called St. George, who rescued a princess from a dragon and in return was able to baptize the Pagan people to Christianity. The story says that every year a maiden was sacrificed to this dragon. One year when the princess was going to be sacrificed, St. George decided to rescue her. Using his sword, Ascalon, he was able to stab the dragon and later slay him. This may be one of the most popular heroic stories involving the death of dragons, although there are many. The story of St. George and the Dragon has been told for centuries. Like St. George and the Dragon, many other stories have been told about dragons and the heroes who kill them. One story like this comes from Norway. The king left his daughter in the castle while he went away on a long trip. He left her a tiny dragon to be her guardian. The princess was skeptical of the tiny creatures, fearing that it could not protect her. However, the dragon soon grew into a large monster. He soon became too good of a guardian for the princess when he grew large enough to wrap his body all around the castle and not let anyone in or out of it. When the king returned home, even he was not permitted inside the castle. The only thing to do was to kill this dragon, so the king offered his the marriage of his daughter to anyone who could kill this dragon. No man in Norway was capable, but a man in Sweden finally killed the beast. As his reward he married the princess and they returned to Sweden together. Another story is about another young man who fought a dragon for the reward of bringing the king's daughter to his master for marriage. In this story Tristan is tricked by another man who wants the princess for his own wife. In the end Tristan cut off the dragon's tongue as proof of his accomplishment and the lies of the other man were discovered. During the times of dragons in England, anyone who killed a dragon was awarded knighthood. In ancient Rome, dragons were thought to hold the mysteries of the earth. Romans looked to dragons as a source of knowledge and used them as symbols of strength for their military. They used two forms of dragons, one which was used for heroism, to protect them, and the other, a fearsome dragon, used as a threat. Other tales about dragons are more about their toes then the dragons themselves. How many toes a dragon has is quiet significant. Many different kinds of dragons are said to have 3 toes. The 4 toed dragons are said to be the earth dragons. But the 5 toed dragons are the most respected of all. Only a king or a high noble had the privilege of wearing a picture of the 5 toed dragon. In ancient times if a peasant was seen wearing the symbol of the 5 toed dragon, he would immediately be put to death. Dragons seem to have come from exaggerated myths about huge snakes, lizards or other reptiles. One type of dragon is actually called the Wyrm, and has a very snake-like form, with a dragon head. Another smaller form of dragon is called a dragonlet. These dragons are also venomous and can be deadly. In the story The Dragonlet of St. Pilatus, only man with a bad temper and skills with a sword was able to defeat this monster that was only the height of the hero. In almost every culture and all throughout history there are stories of these magical creatures called dragons. Whether you live in Cambodia or Scotland, Lithuania or America, you have probably heard of dragons. The Eastern Dragon, sometimes called Lung (in China) or Long (in Vietnam), may almost seem like a completely different creature than the Western Dragon. Not only their anatomy, but also their behavior, their symbolism, and what they mean to the society they effect. The East seemed to value dragons for their magic and beauty. They were held with high respect from the people in the East. However, this view is drastically changed in the West, where dragons were viewed as monsters. It could be that the reason each dragon is different between cultures is because the people had never actually seen one, only heard stories and descriptions of them. Thus over the years some people may have changed what they heard when they said it unto someone else. this is a sacred relic that people looked upon as a reminder that there are good and evil dragons. This dragon is the famous dragon that is always heard about, the guardian of a massive treasure.